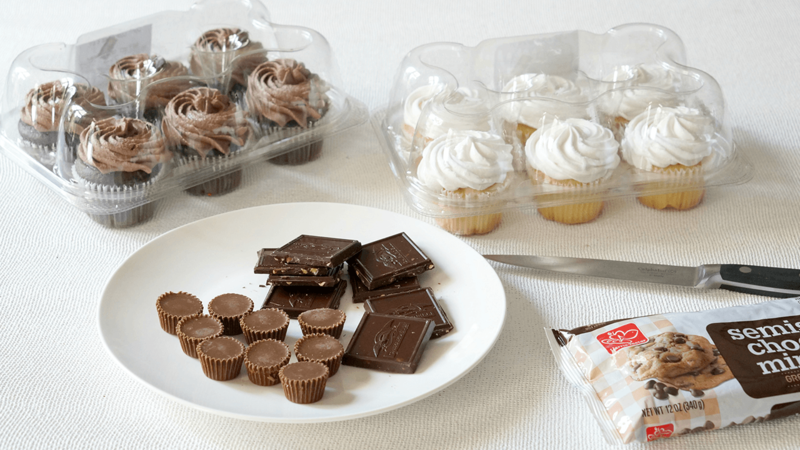 Make your commencement party extra special with our themed dessert bar. Every grad will enjoy one of these easy-to-make-graduation themed party foods! Whether you are celebrating a college graduation or a preschool continuation ceremony, this is the season to celebrate goals accomplished. And what better way to do that (while enjoying the journey), than with great food? Our Graduation Dessert Bar has something sweet for everyone, with a nod to the guest of honor: a Mortarboard Crispy Cake, Cake Roll Diplomas, and Mortarboard Candy Cupcakes. Unlike a lifetime of schooling, however, these desserts are easy peasy. You can still take a bow. 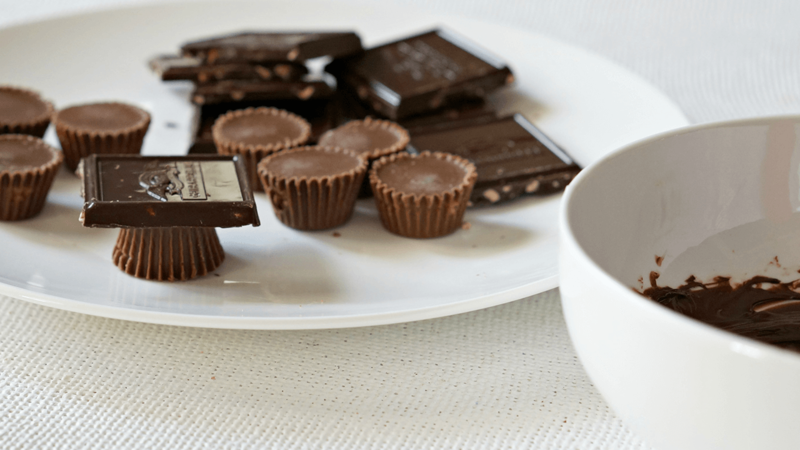 Unwrap mini peanut butter cups and cut chocolate into large squares. Melt ¼ cup of chocolate chips in 15 second bursts in the microwave until you can stir it into a smooth chocolate paste. Add a dollop of chocolate to the bottom (narrow) end of the peanut butter cup and secure a piece of chocolate, using the melted chips as glue. Once cool, insert the “mortarboard” into the icing of your favorite cupcakes. 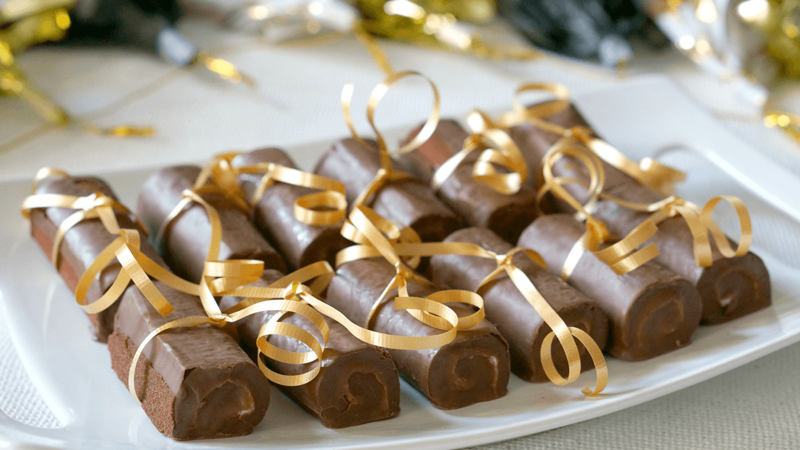 Unwrap cake rolls. Wrap a ribbon around them. Enjoy a few before the guests arrive. Add ¼ cup butter, 1 10.5 ounce package of marshmallows, and 1 cup of chocolate chips to a large microwavable bowl. Heat for 30 seconds and stir. Continue microwaving in 20 second intervals until smooth. 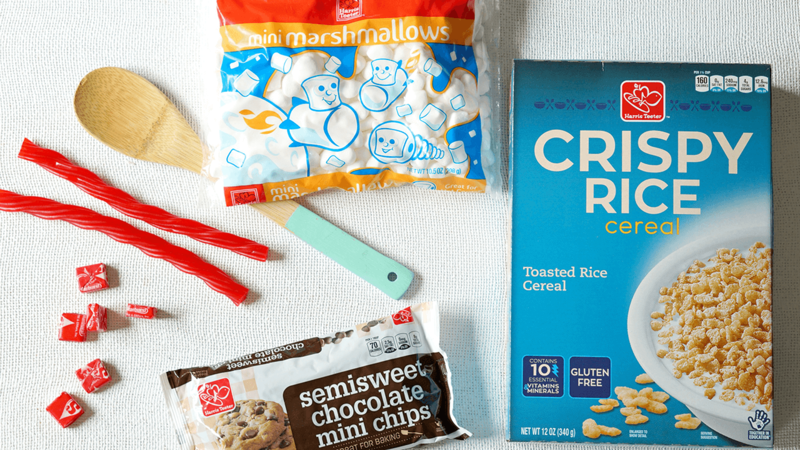 Stir in 6 cups of Harris Teeter Crispy Cereal. Line a baking bowl and brownie pan with aluminum foil and coat with cooking spray. Fill each container with the cereal mixture and press down. Melt a second cup of chocolate chips in 30 second intervals until smooth. 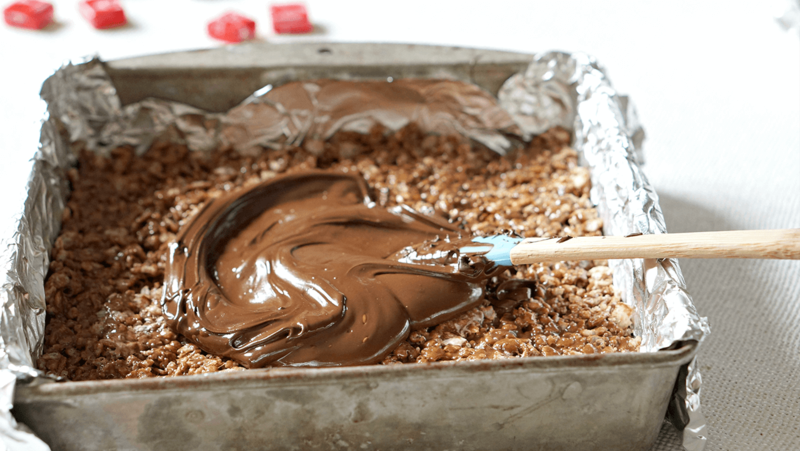 Pour on top of the brownie pan filled with rice crispy mixture. This will be the firm-underside of the mortarboard so it doesn’t sag. Place the brownie pan in the freezer for thirty minutes. Allow the cereal mixture in the bowl to cool to room temperature. When you are ready to assemble, melt ¼ cup of chocolate chips until smooth. 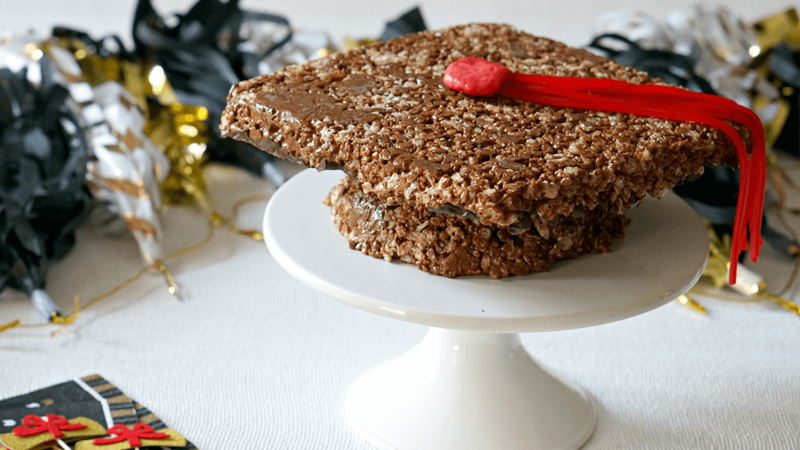 Remove the rice crispy treat from the bowl and place on a cake plate, wide-side down. Spread a tablespoon or two of chocolate on top. Remove the rice crispy treat from the brownie pan and place on top, chocolate candy side down. Peel apart several strands of Twizzler Pull ‘n Peel. Microwave two Starburst candies for about 10 seconds… until just warm enough to mold. 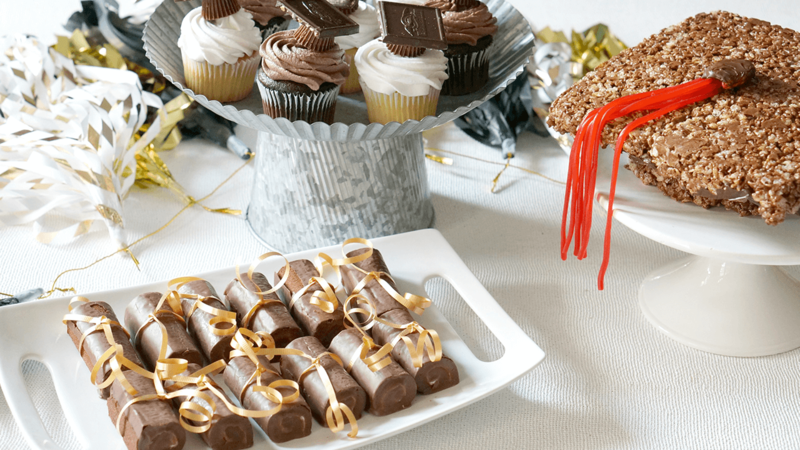 Wrap the Starburst candies around the Twizzler strands and secure to the mortarboard with a big of melted chocolate.